Luke tutted and looked across the park. At 8.27 there was no one else there but he knew they would come. And when they did, he would be ready. On one side of the park was the school, on the other, the pony paddock. The top and bottom edges skirted the ends of back gardens. With his binoculars Luke could see it all clearly. He waited. At 8.49 a dog walker entered the recreation field and walked around twice. Luke pretended to read his comic while secretly watching the person’s every move. No litter was dropped. At 9.12 and 9.18 two more dog walkers arrived at opposite sides of the park. One threw a ball for his dog, the other kept her dog on a lead. No litter was dropped. For Luke time was passing extremely slowly. He had read his comic three times and it was losing its appeal. At least his enjoyment of the gobstopper was not waning. “I don’t see why I should have to clean up other people’s mess!” Luke complained to Rusty who was sitting on a cabbage leaf, watching him. Mrs Tebbut had followed through on her threat to send home a letter after the zoo trip and Luke’s dad had sentenced him to a month of weekends cleaning up litter. Luke was bitterly resentful at the injustice of it all. Rusty, Ash and Scratcher, the only witnesses to this tirade, did not attempt to answer him. They were used to his rhetorical rants and knew it was best to just let him get it off his chest. Sitting with his friends in ‘the damson patch’, as it was now known, letting off steam with the only ones who really understood him, was a kind of therapy for Luke. He always felt better afterwards. But at the park Luke felt humiliated. It was Saturday morning; scouts were having football practice; skateboarders were zooming up and down their ramps and slopes; little girls were skipping rope and playing hopscotch. Luke felt like everyone was smirking at him picking up litter. It was disgusting. Disgusting people had dropped their disgusting rubbish and he was forced to clean up after them. It made him so cross. Then he noticed his dad trying to get his attention. Maybe he was going to let him off. Maybe he’d done enough now. Dad went back to reading the paper and Luke seethed. It wasn’t fair! And so the morning continued. Dad read the paper; Dudley sniffed, peed and eventually laid down; and Luke resentfully picked up other people’s rubbish. He spotted a set of six-pack rings in the long grass and reached for it. It moved. He reached for it again and it moved again. 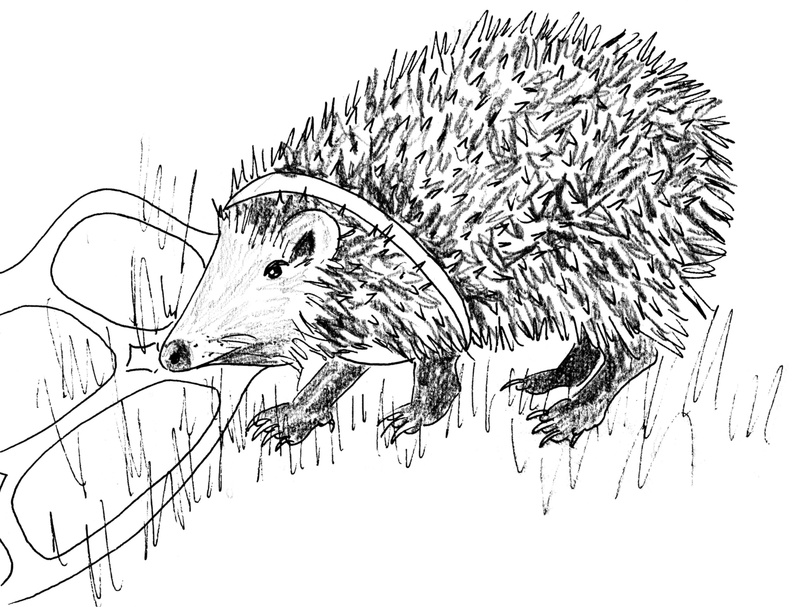 Luke parted the long grass and found, with one of the rings caught tight around his body, a little hedgehog. She cut it off and then gently cleaned the hedgehog’s wounds. “His armpit,” Luke clarified in case anyone was unsure to which wound she was referring. Luke suddenly saw the job of picking up litter in a very different light. It was a very important job and, in conjunction with punishing droppers, was outlaw work. The vet said that she would take care of Spiker until he was better and then she would call them to pick him up and they could release him where they found him. ➔ then he would teach them a lesson. All afternoon Luke and Dad picked up litter. They filled three and a half large dustbin bags with bottles and cans, crisp packets and sweet wrappers, fast food containers and carrier bags. Luke also found a £2 coin which Dad said he could keep for being such a good worker. “Nice to be ‘preciated for a change,” thought Luke and spent 99p of his hard-earned cash, on the way home, on a giant gobstopper. Part one of his plan was complete. Now, on Sunday, he was carrying out part two. It was slow going. His eyes glazed as he stared across the empty park. “There’d be no shame in bringing more than one comic in future,” he decided. Then, at 10.06, on one side of the park, seven Year 6 boys entered, laughing and pushing and kicking a football between them. At the same time, on the other side of the park, came Simon Butler, Kenny White, Becca Nithercott and Christina Burkiss, all from Class 4 – Luke’s class. Becca and Kenny were carrying large, brightly-coloured kites. Luke shrank down behind his Beano. The Year 6 boys raced around chasing their ball and shouting insults at each other. The class 4 kids took it in turns to run across the field trying to keep their kites aloft in the windless sky. Luke kept his eyes on them all as discreetly as he could. No litter was dropped. He was getting awfully tired of sitting still. Then the football suddenly flew higher and further than intended and landed in one of the back gardens. Luke watched as one of the Year 6 boys vaulted the fence to retrieve it. Simon Butler! Where did he come from? Luke tried to look nonchalant. With slow deliberation he took the gobstopper out of his mouth. This was no good. Butler was drawing attention. And he was distracting. Now there were only five Year 6 boys – where did the other two go? Simon Butler climbed onto the bench next to Luke and sat on the back of it, his feet on the seat. This was infuriating. Flamin’ Butler! Luke had to get rid of him and he could only think of one way to do it. “Is that yours?” he pointed to a £1 coin on the ground. “er, oh yeah, I must have dropped it just now,” Simon lied as he stooped to pick it up. He called to his friends. And he ran off without giving Luke another thought. Luke put the gobstopper back in his mouth and wiped his sticky hand on his trousers. There were seven Year 6 boys again. The missing two had returned with snacks. Luke knew their faces but not their names. One of them was Katia Haines’s brother so his surname must be Haines. Luke picked up his comic again and peered over it in their direction. The big boys hung around the swings, some sitting, some standing. The tall one thought it was funny to throw one of the swings over the top of the frame, over and over again until it was too high up for anyone to sit on. They all had crisps and pop. Katia’s brother spat chewing gum on the ground before getting stuck in to his crisps. There was a litter bin next to the swings and when the boys had finished snacking they, one by one, tossed their rubbish into it. Each boy took his throw further from the bin than the one before him, to demonstrate his superior skills. Haines went last and missed. The others laughed and teased him for his ineptitude when his rubbish hit the ground, so he proved them wrong by hitting every one of them with the football. All seven scuffled noisily out of the park. then he went over to the swings and collected the rubbish. Suddenly he heard Butler’s loud shouting voice. The class 4 kids were coming back! Quickly he ran north and concealed himself behind the trees next to the pony paddock. He watched them through his binoculars. They sat together on the bench, eating crisps and drinking pop. Kenny White also had a sherbet fountain. Luke waited patiently for Butler to drop his rubbish on the grass. His pencil was poised for the inevitable notebook entry. Simon Butler would then be taught a lesson. But Simon Butler did not drop his rubbish on the grass. He put it in the bin, as did Christina and Becca. Luke was begrudgingly impressed. He looked at his watch. It was 1.54pm. 1.54! Mum had said 2 o’clock, don’t be late! He had to get home for dinner! But he couldn’t come out from behind the trees, they’d know he’d been spying on them. He had to wait. So he waited. And he waited. “Don’t you lot ‘ave ‘omes to go to?” he asked under his breath. He looked at his watch again: 2.01. He heard Becca shouting. They all ran and Kenny, being the last to get there, found no swing for him (the fourth having been wound around the top of the frame). He shrugged and said he was going home for dinner. The rest of them followed his example. 2.09. Luke emerged from his hiding place and ran across the park. As he sped past the bench something caught his eye. He stopped. Looked back. There was something on the ground under the bench. Sunday evening. It was nearly bedtime. Luke emerged quietly from his brother’s room. “Hey! What are you doing in my room?” Jared scowled. Jared eyed his younger brother suspiciously. It wasn’t like him to be so considerate. Luke stomped off to his own room. Monday morning. Time to implement part three of the plan. Luke, wearing full school uniform, was finishing his jam and toast when his mum entered the kitchen at half past seven. She was stunned. Normally she had to call him at least three times before he’d get up, and even when he was up he had to be constantly nagged to get dressed and breakfasted. He didn’t appear to have had a shower and he was wearing Friday’s dirty shirt, but Mrs Walker decided to let that go. Mrs Walker, known by Luke to be very distrustful, looked closely at her youngest son. Luke smiled, put his gobstopper back in his mouth and went upstairs to clean his teeth. He was at school a good twenty minutes before most people got there. Even Mrs Tebbut wasn’t there yet. He went in to his classroom. He furtively looked around to confirm he was alone and then rushed over to the drawers. Everyone had a drawer with their name on. They kept their books and pencils and stuff in them. He found Kenny White’s drawer and pulled it out. Then he took from his bag Kenny’s droppings – 1 panda pop can, 1 crisp packet and one half-empty sherbet fountain. He pushed them into the drawer and closed it. Then he ran outside to kick a ball around on the playground until the bell went. After the register had been called everyone had to line up for assembly. Luke took his place at the end of the line, followed the rest of his class into the hall and sat down on the floor behind class 3. He watched all the other classes file in and the assembly began. He sat still, faced forwards and pretended to be interested. When it was half way through he tried, quietly, to get Mrs Tebbut’s attention. “Psst, psst, Mrs Tebbut,” he whispered. She didn’t hear him. He coughed. She didn’t turn her head. He faked a loud sneeze. She frowned at him. She silently shook her head. “Please Mrs Tebbut, I really need to go,” he whispered a little louder. The children near him started to snicker and Mrs Tebbut reluctantly gave in. Luke did as he was told. Once back in the classroom he grabbed his bag and exited through the cloakroom. He ran to class 6, the long way round so as not to pass the hall, and entered their cloakroom. He scanned the names above the coat pegs until he found what he was looking for. Yes! There it was. Haines. On Haines’s peg hung Haines’s coat and into its pockets Luke deposited Haines’s droppings: 1 Tango can, almost empty, upside down; 1 crisp packet, almost empty, upside down; and 1 used piece of …… oh no! Luke found that the chewing gum he’d wrapped in paper when he’d recovered it from the crime scene, was now as hard as plastic and therefore unfit for purpose. He needed something sticky. Of course! With almost no hesitation – he reminded himself it was for a very important cause – Luke spat what was left of his gobstopper into Haines’s inside pocket. Part three complete. The man’s voice behind him made Luke’s cheeks flush hot. He turned round and reached into his bag. He handed Jared’s book to the Year 6 classroom assistant. “Thanks,” said Luke and ran back to his own class. He opened the door just in time to witness Mrs Tebbut holding up a cola-soaked, sherbet smeared, grease-stained copy of the new History text book while shouting at Kenny White. Luke sat down quietly and waited for lessons to begin. We couldn’t wait until tomorrow, we had to read to the end 🙂 What a great story! We loved it! Fantastic ending, so tense and anxious! But he got away with it beautifully. We loved the ending when Mrs Tebbut mad. 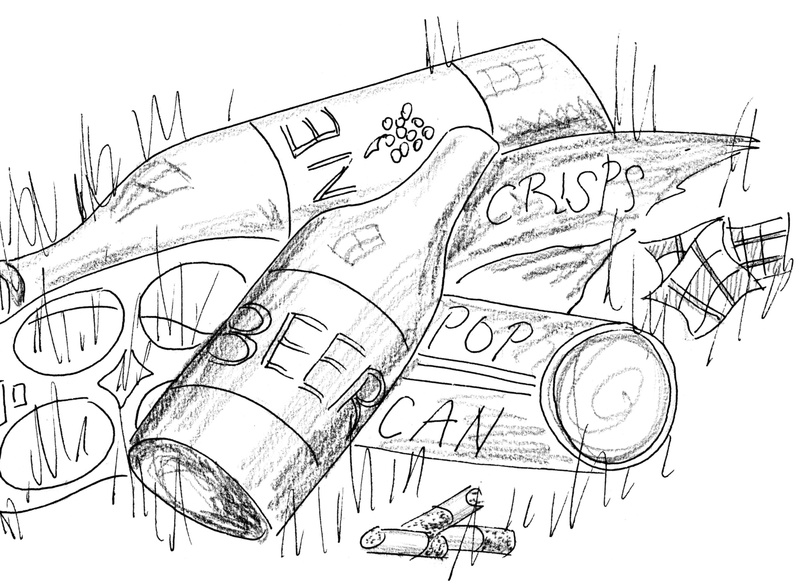 It’s like a magic curse – if you litter, you will find it in your drawer or your house or your bed. Like a boomerang. Also we are big fans of jam on toast in this house, and glad to find that Luke is too.